Alice welcomes Amylia, our new PADI Divemaster intern! Home/News, Professional Diving Internships/Alice welcomes Amylia, our new PADI Divemaster intern! 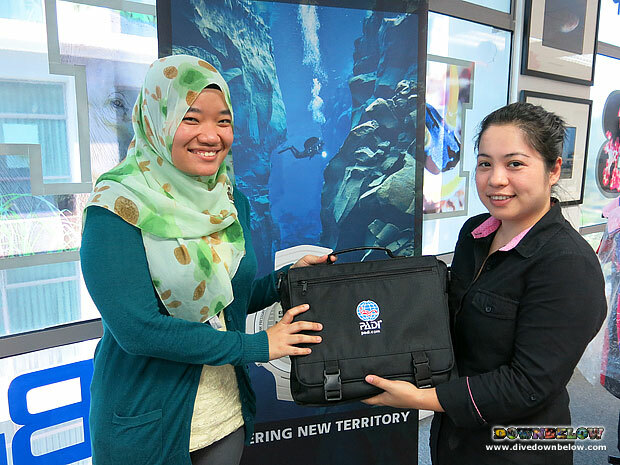 Amylia drops by our Kota Kinabalu Times Square Head Office to have a chat with Alice about her PADI DIvemaster internship program at our premier PADI 5 Star IDC Dive Centre on Gaya Island, Borneo! Now Amylia has received her PADI Divemaster Crewpak, she can start studying dive theory topics, such as equipment, physiology and physics! We are confident Amylia will grasp all the knowledge development needed to excel in the various scuba diving skills, scenarios and workshops of the PADI Divemaster course! Contact any of our Head Office staff to discuss any professional scuba diving internship programs we conduct at our beach house! We can tailor your program to suit your needs and guide you to making your diving dream a reality! By Joanne Swann|2014-03-31T13:59:58+08:00March 31st, 2014|News, Professional Diving Internships|Comments Off on Alice welcomes Amylia, our new PADI Divemaster intern!